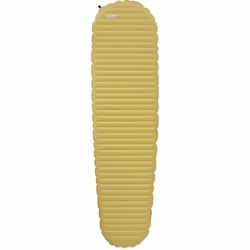 Therm-a-Rest Women's NeoAir XLite Sleeping Pad. The women’s NeoAir XLite mattress delivers more warmth and comfort per ounce than any other three-season air mattress available. Cold sleepers will appreciate our Women’s version, featuring an added layer of our reflective ThemaCapture™ technology for added warmth. This year, new softer fabrics bring better next-to-skin comfort and boost in durability with no added weight. For the discerning alpinist, thru-hiker or backcountry minimalist who’s counting every ounce, there is simply no better choice to assure the kind of rest you need to get done what you’ve got planned for tomorrow. Stuff sack and repair kit included. Warm: Multiple ThermaCapture™ layers trap extra radiant heat for cold sleepers, without the bulk, weight or durability issues of down and synthetic fills. Comfortable: 2.5” (6 cm)-thickness, new, soft-touch fabrics and baffled Triangular Core Matrix™ structure provide unrivaled stability and support.